Hello, and welcome to the “S” Word LIVE. My name is Renee Hribar. I’m a sales strategist, TedX speaker, and author, and I’m coming to you today live to share with you something massive that helps make sales simple and fun. In fact every single week I come back and I share some nuggets from the amazing clients that I get to work with day in and day out. In fact I’ve been doing this for over two decades, teaching thousands of people to sell millions of dollars in products and services. And I’m so thankful for the planet Internet that we live on. I am in Detroit today. Let me know in the comments below, whether you’re live or on the replay, where you are in the world today. 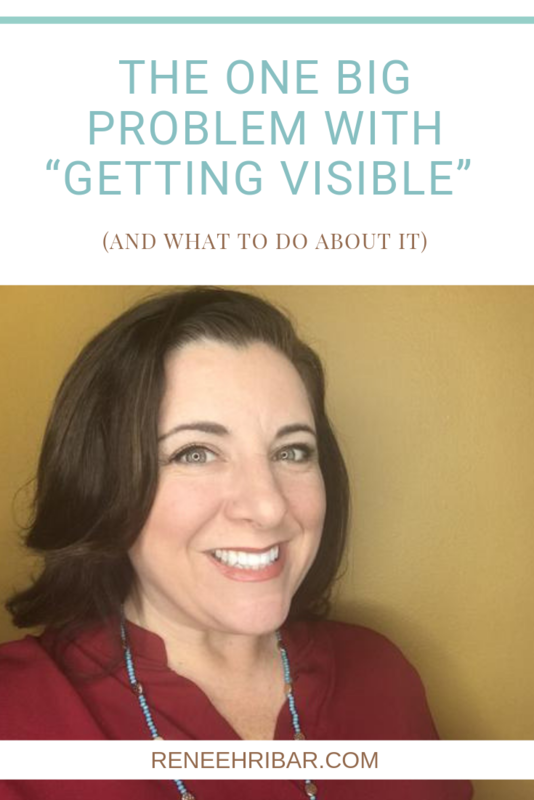 I want to talk about the one big thing that is the problem with getting visible. Who here. Hey Stef. Hey Lori. Say hello as you join. What is that one big problem with getting visible? I know that I when I first came to the online space I bought my share of productivity planners and social media planners and content calendars and I bought all the seven dollar and twenty seven dollar and thirty two dollars things that were thrown into my news feed because Facebook pixels. So hey, Lori is Team Michigan. Yes. Michigan. It’s finally getting warm here. So what is the problem with getting visible? I see it all the time. In fact this is what happened to me. Did you see that? That was awesome. It literally spit it out at me. That is awesome. Oh my God that was so funny. Let’s see if I can get this to work. Nothing like live TV kids. All right. So let’s see. It literally spit it out. And I caught it. I think that was the best part. I frickin caught it. OK so I was sitting in a room I had bought into this idea that if I just posted enough, if I just posted the right words, if I just was in front of the right people, then they would line up and gladly hand me their credit card to finally get the help that they deserved and needed that I so expertly could solve. However this is what happened instead. I ended up you know having a very religious process of content scheduling and content creation and putting myself in the right places. But I ended up in a roomful of women who couldn’t even afford my most basic service. So I am a sales strategist. I help people literally make money and they weren’t even able to afford at the time my entry level program. I was like What am I even doing here? What the heck. So all that posting, all those words, all that effort was like What do I do now? So that was a big problem and I figured out how to make it work. So when I work with people this is my advice to you today is if you like to talk to people maybe it’s not a big idea to try to go live. Everybody has a production studio in their pocket. So if you do a livestream or if you’re a writer you do a blog or if you just love to be behind the scenes and you got one of those rich voices like I always tell my husband like he could’ve been a radio star if they hadn’t killed the radio star if video hadn’t killed the radio star. I remember that song from the 70s. Who remembers that song right? Like oh gosh what is it? Radio killed the video star you know? Video killed the radio star. Can I get it right? My phone’s popping out. I can’t get the right name of the song. You’ll have put it in the comments if you know what I’m talking about. Anyway long story short if whatever your thing is, do that one thing every week. For me, it’s my “S” Word LIVE show. I love talking with people. I love being face to face. I might not be able to see your faces, but I can hear, I can see your comments, and then I get to talk to you afterward. And that, my friends, is the real key. What I just said there. I get to talk to you afterward. So whether you’re watching this on whatever platform or hearing it somewhere. I have a link to somewhere that will continue the conversation. That was the missing piece. And that was where most people were dropping the ball. They would just put it out there, spend all this time and effort trying to create the right images, getting photo shoots, doing all the things they thought were necessary. Which, hey, eventually it’s always nice to look nice, but it’s not necessary at first, especially if you haven’t gotten your first or you’re struggling to get enough clients. And honestly, I mean with today’s technology we can literally live in the middle of nowhere on an island, a literal island, and still be able to run a fifth Avenue style service. Right. So at the end of the day what I’m saying is there’s no reason for us not to reach, out not to connect with that one piece of anchor content every week. And that’s what I call it. I teach my my students and my clients anchor content. What is that one piece? And this is my piece that I do every week, and then I make sure that there is a link, a pathway, a direction to continue the conversation. Like for me I’m always going to invite you to continue the conversation by clicking the link. So today I have this amazing little bot that I helped write and create and someone else did the tech and I was able to have that bot say things that I would want to say, because there’s more and more people now connecting with that one piece of content every week. And so if you click the link above you’ll also get invited to that pathway. Hey let’s connect again next week for the show. Hey how about a free gift that will help you with your sales training? It’s got videos and workshops and workbooks and hey let’s even continue the conversation further and let’s hang out in a free Facebook group together where we have social prompts and this week is all about shameless sharing in there. I’ve got all kinds of fun things happening live. Group coffee chats, a way to connect. So that link, that next thing that you have someone do once you have that one piece of anchor content, that is where the continuation happens because all that content all it does getting visible is it brings people to your story, your doorstep, but if you really want to convert those viewers into actual clients, where the rubber meets the road, right where the money gets deposited, what you’ll need to do is get great at having a conversation with someone. And I live in the digital marketing world friends. I am a digital marketer. However, what I know to be true and what I sing from the rooftops and jump up and down about is that we cannot treat our potential clients as data made on a matrix. We cannot. We have to treat them as humans. And I see it all the time. People want to create this huge beautiful amazing program or solution and they want to sell it in the masses. And what I’m saying is that’s great. Down the road. But before you get there you have to learn to sell it to one person first. So you have to get great at dealing with people. It has to be that human to human connection, even though we can be continents apart, oceans apart. And I’m on my screen and you’re on your screen. We still have to find a way to continue the conversation. So if you are blasting out into the world hoping that more content is the answer, I’m telling you it’s not. I’m telling you it’s about finding out who is connecting with that content and continuing the conversation with them. And if you want to know what to say next once people continue the conversation with you and what to say to continue it, then guess what. You can click the link and you’ll learn all about it. All right guys. Have a great day. Thank you so much. If you know someone who needs to hear this, share the video, share it around. This is free content for all to enjoy. And you know what? Maybe today this is exactly what someone needs to hear to help them make sales simple and fun. See you next week. Hello Steph Duran de Rodriguez!!! Alesia Galati YES! That’s the key!! Robin Carberry remember this song?? WE should do this for our next karaoke night out!! Lol! My cat did that to me today when I was live! The first MTV video ever! Such an important message! Thank you Renee HribarSuch an important message! HILARIOUS!!! I was as surprised I caught it Katie Wight!! Hilarious 🙂 Love it!!! Real life! Totally Hilarious Pamela Johnson Lewerenz!! Love this advice – so good! Just getting back into doing livestream video.